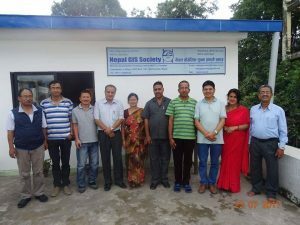 The Nepal GIS Society (NEGISS) is a professional society founded in July 23, 1995 (Shrawan 07, 2052) and registered at Chief District Office Lalitpur by following regulation of the Government of Nepal. It has over 200 members including, institutional, life, general, and student and associated types. By statute, Society has every 3 years term of executive committee members to execute regular activities elect from the AGM through the democratic procedures. Society is also sincerely hoisting its nation building responsibilities with registered under the Social Welfare Council Nepal, regular renew, following financial discipline by registered within the government tax system through permanent account number (PAN), value added tax (VAT) number and maintaining regular auditing and transparent account systems. Broad vision of the Society is to establish network among the GeoInformation professionals and stakeholders for geo-Information knowledge, skills, technology and overall development of GIScience through workshop, seminar, research, advocacy, consultation service, training and awareness programmes at national and international level. The main mission of the Society is to establish wider network among the resourceful GeoInformation professionals, expand GI education and develop spatial decision support systems for the sustainable development through workshop, seminar, advocacy, consultation service, training and awareness programmes and outreach research in multi and trans-disciplinary fields at national and international level. Nepal GIS Society has been formed with clear objectives of furthering the use and application of Geo Information Science and spatial data analysis technologies in the country as an aid to our mainstream endeavors in ensuring sustainable human development through effective management and mobilization of our spatial diversities, resource bases and human capabilities.